India Authentic is a 16-issue unconnected series of comic books that tell selected stories of various Hindu deities; this review is based on issues #1-14, as I do not have access to the last two issues. Each issue is devoted to a specific God or Goddess, and most of them tell a single story from the mythology related to that deity. The deities selected are, from the perspective of a Westerner withsome familiarity with the broad outlines of Hindu religion and myth, a good mix of the familiar (Krishna, Shiva, Ganesha, and so on) and the obscure (Uma, Kartikkeya, Andhaka and others). The series is written by Saurav Mohapatra, and illustrated by various artists in the former Virgin Comics stable (now Liquid Comics). For anyone familiar with other comic treatments of Hindu mythology, such as the popular Young Krishna or the publications of Amar Chitra Katha, the very modern — and very Western — art in these comics will come as quite a surprise. This is no pious prayerbook treatment, or even that of a Classics Illustrated. These volumes are clearly intended first and foremost as entertainments for a fairly sophisticated comic readership; and while they contain nothing that I find objectionable for my 10-year-old daughter (who enjoys them quite a bit), there is plenty of action and frequent, though not particularly bloody, violence — reasonably so, truly, when many of the stories are of battles between men, or between Gods and demons. Since each issue has a different illustrator, it is a given that there is a lack of visual continuity across the series; however, all of the art falls within the range of the clearly defined “house style.” This style is in evidence in all of the Liquid Comics titles I have seen, mostly in the sample issues available on their website. Of course, the art — while very important — is only part of the experience of reading a comic. Good writing is also vital, and here the message is both more uniform and potentially more troubling. The whole series has a single writer, so the authorial voice is much more consistent than the art, and as good as most comic writing … which is to say that is it competent, without ever being really exceptional. To the best of my knowledge, the selected myths are presented accurately in and of themselves … although the chosen medium does dictate a bias towards stories involving a lot of action, which in the aggregate might give a slightly misleading impression of the tone of the bulk of Hindu myth, I don’t recall seeing or reading anything in the individual stories themselves that stuck out as erroneous or biased. Which brings me to the only real complaint I have about the series, and the one thing that might make me hesitate to recommend these books to a pagan or polytheist reader — the introductions. 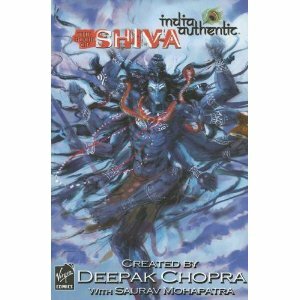 Each issue has a 1-2 page introduction by Deepak Chopra. Those who are familiar with Chopra’s other writings will not be surprised to learn that he is not a believer. He imposes a psychological and humanistic interpretation on the Gods and their stories at every turn, even going so far in one issue (Vishnu) to say that “… the power of ordinary people … loft[s] us beyond the means of even the Gods.” I found these introductions extremely off-putting and more than a little irritating. And what is more, I believe that they do a disservice both to the Gods and to the (presumed) desire to spread knowledge of the mythology among English-speaking Western readers. However, I do encourage everyone to check them out for themselves — the first ten issues have been collected into two volumes, and at least some of the individual issues can be found at various outlets online. To read the first volume in this series (Ganesha) online, as well as the first issues of most of Liquid‘s other titles (some of which, particularly The Sadhu and The Tall Tales of Vishnu Sharma, are quite entertaining), please go here.